Dr. Susan Bennett was recently awarded the “Lifetime Achievement Award “ from the Consortium of Multiple Sclerosis MS Centers. The Consortium of Multiple Sclerosis Centers (CMSC) is pleased to announce that Susan E. Bennett, PT, DPT, EdD, NCS, MSCS, has received its 2016 Lifetime Achievement Award. The award was presented during its 30th Annual Meeting in National Harbor, MD, on June 3, 2016. 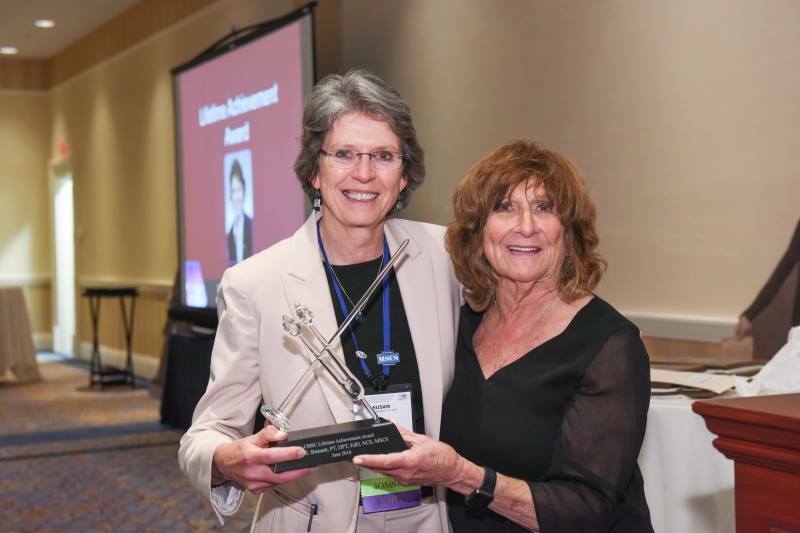 The CMSC Lifetime Achievement Award recognizes an individual whose decades-long commitment has driven significant advances in the care of people with MS.
“This is the first-time that an individual from the rehabilitation field has received this award. Sue Bennett is a pioneer in rehabilitation practices and the role it plays in the comprehensive care of neurological disorders, especially with MS. She has also been an invaluable leader and role model for CMSC, and her unwavering commitment to enhancing the care and quality of life of people with MS, and their families, reflects the highest ideals of the CMSC and all of our allied organizations,” said June Halper, CEO, CMSC.